This chapter firstly explains the different types of harms experienced by victims of gender-based violence and the typologies of perpetrators of intimate partner violence. It also explains the use of terms such as gender violence, domestic and family violence, intimate partner violence, Indigenous partner violence. International responses to gender violence and the degree of state intervention in economically wealthy and poorer countries, is presented to show how such violence is perceived and addressed globally. The second part of this chapter focuses on the Australian legal landscape. 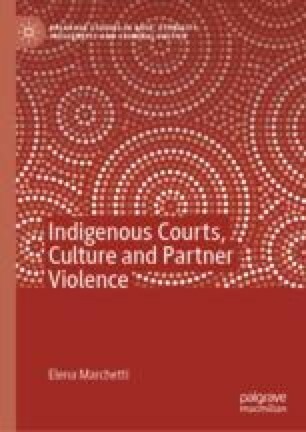 Differences in how Indigenous and non-Indigenous domestic and family violence is treated by police and the criminal justice system, and the extent to which domestic and family violence laws, policies and court programs are unable to accommodate the needs of Indigenous victims and offenders, are topics that are explored in the second part of this chapter. Australian Bureau of Statistics (2016) 4906.0—Personal Safety, Australia 2016. Canberra: Australian Bureau of Statistics. Available at: http://www.abs.gov.au/ausstats/abs@.nsf/mf/4906.0 (Accessed: 23 July 2018). Australian Government, Department of Social Services (2018) Women’s Safety: The National Plan to Reduce Violence Against Women and Their Children 2010–2022. Canberra: Australian Government. Available at: https://www.dss.gov.au/women/programs-services/reducing-violence/the-national-plan-to-reduce-violence-against-women-and-their-children-2010-2022 (Accessed: 14 September 2018). Bachman, R., Zaykowski, H., Kallmyer, R., Poteyeva, M. and Lanier, C. (2008) Violence Against American Indian and Alaska Native Women and the Criminal Justice Response: What Is Known. Delaware: Department of Sociology and Criminal Justice, University of Delaware. Available at: https://www.ncjrs.gov/pdffiles1/nij/grants/223691.pdf (Accessed: 15 May 2015). Boyce, J. (2016) Victimization of Aboriginal People in Canada, 2014. Ottawa, ON: Statistics Canada. Available at: https://www150.statcan.gc.ca/n1/pub/85-002-x/2016001/article/14631-eng.htm (Accessed: 1 August 2018). Carrington, K. and Phillips, J. (2003) Domestic Violence in Australia—An Overview of the Issues. Parliament of Australia. Available at: https://www.aph.gov.au/About_Parliament/Parliamentary_Departments/Parliamentary_Library/Publications_Archive/archive/Domviolence (Accessed: 12 August 2018). DeKeseredy, W. S. and Schwartz, M. D. (1998) Measuring the Extent of Women Abuse in Intimate Heterosexual Relationships: A Critique of the Conflict Tactics Scales. Harrisburg, PA: VAWnet. Available at: http://vawnet.org/sites/default/files/materials/files/2016-09/AR_Ctscrit_0.pdf. Gordon, S., Hallahan, K. and Henry, D. (2002) Putting the Picture Together: Inquiry into Response by Government Agencies to Complaints of Family Violence and Child Abuse in Aboriginal Communities. Perth: Department of Premier and Cabinet, Western Australia. Available at: https://www.slp.wa.gov.au/publications/publications.nsf/DocByAgency/FEB7D71FB3A6AF1948256C160018F8FE/$file/Gordon+Inquiry+Final.pdf (Accessed: 20 November 2018). Northern Territory Board of Inquiry into the Protection of Aboriginal Children from Sexual Abuse (Wild, R. and Anderson, P. (Chairs)) (2007) Ampe Akelyernemane Meke Mekarle, ‘Little Children are Sacred’. Darwin: Northern Territory Government. Available at: http://www.inquirysaac.nt.gov.au/pdf/bipacsa_final_report.pdf (Accessed: 20 November 2018). Rosay, A. B. (2016) Violence Against American Indian and Alaska Native Women and Men. Washington, DC: U.S. Department of Justice, Office of Justice Programs. Available at: https://www.ncjrs.gov/pdffiles1/nij/249736.pdf. Steering Committee for the Review of Government Service Provision (2014) Overcoming Indigenous Disadvantage: Key Indicators 2014. Canberra: Productivity Commission. Available at: http://www.pc.gov.au/research/recurring/overcoming-indigenous-disadvantage/key-indicators-2014#thereport (Accessed: 20 November 2018). United Nations General Assembly (1993) Declaration on the Elimination of Violence Against Women. Geneva: United Nations. Available at: http://www.un.org/documents/ga/res/48/a48r104.htm (Accessed: 15 August 2018).